The Huawei P20 Pro is without a doubt the standout phone of 2018 so far. Nothing comes even remotely close — not even the much féted Samsung Galaxy 9. Alongside this premium handset, Huawei released the ultra-extravagant Porsche Design Huawei Mate RS, which starts at €1,695 (roughly $2,091) and only gets pricier. On the inside, this is largely the same as the aforementioned P20 Pro, but with some gorgeous luxury touches that cements its appeal to the cashed-up few that’ll ultimately buy it. Huawei loaned TNW a review unit for four days, allowing us to road-test (pun absolutely intended) the device. Ever wondered how the other half of society tweet, talk, and text? Read on to find out. As previously mentioned, the Porsche Design Huawei Mate RS is heavily derived from the recently-released P20 Pro. My colleague Napier Lopez will be reviewing this in the coming days, so I’m going to deliberately avoid rehashing anything he’ll inevitably say. I won’t, for example, talk much about performance or the device’s software (although I’m working on a separate piece about the camera system on both phones, because they’re that good). The Huawei Mate RS carries the marque of the iconic design house, Porsche Design. 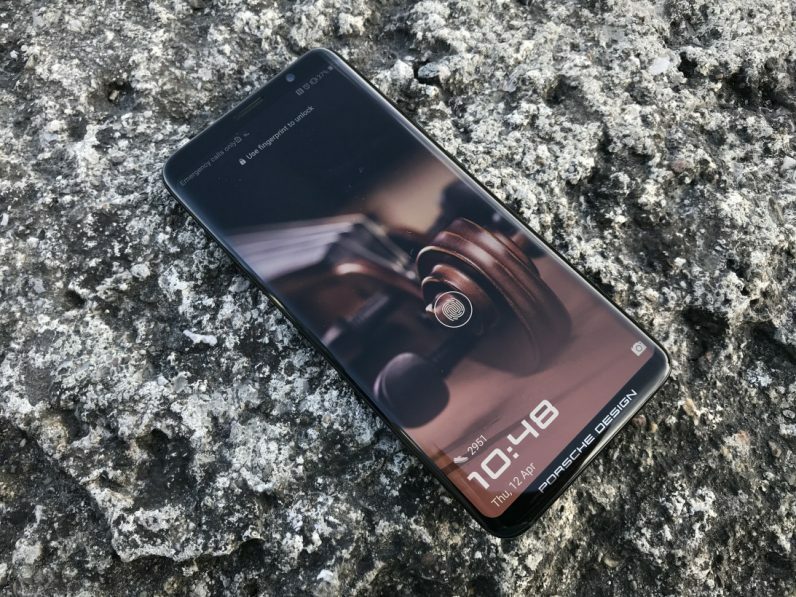 It’s important to emphasize that unlike certain phones carrying the name of an iconic car manufacturer, Huawei didn’t just license a brand here; Porsche Design took a leading role in creating the look and feel of this phone. You can see this by contrasting the Mate RS with the P20 Pro. The latter device has a “notch” in the screen, which houses the front-facing camera and earpiece. Porsche Design are unapologetically notch-sceptical, as the company’s design director, Christian Schwamkrug, explained to me. It believes that tried-and-tested rectangular displays make sense, and the Mate RS therefore has a more conventional design (which I personally prefer). Much like the Samsung Galaxy 9, the Mate RS features a six-inch curved-glass screen that tightly hugs the sides of the phone, giving you maximum real estate. This looked absolutely gorgeous. Given the Mate RS is a fundamentally premium device, it’s no surprise Huawei has made efforts to make it feel premium and luxurious in the hand. Its metal and glass construction gives it a presence that’s weighty, and doesn’t feel cheap. It boasts luxuriously curved corners, and ultra-reflective mirrored back. On the rear, there’s the bare minimum amount of logos and text, and the cameras are slap-bang in the center. This fundamentally minimalistic, symmetrical design is understated, but looks stunning. As phones go, the Mate RS contains three major oddities that distinguishes it from its more mass-market cousin. One isn’t immediately obvious: on top of handset’s HiSilicon Kirin chipset is a layer of 9.7 million PCM microcapsules (which, a Huawei spokesperson told me, are the same type used in space suits). These absorb, store, and slowly dissipate heat, which (in theory) means the phone shouldn’t get too hot. During the short time I used the device, I can’t recall noticing that it got especially hot, even while being thoroughly taxed. Another major oddity is that the Mate RS comes with an under-screen fingerprint reader. This both maximizes the screen-to-body ratio, and lets you unlock your phone merely by resting a digit against the display. Using this felt like a prelude of something bigger to come. Under-screen fingerprint readers will inevitably become a standard feature found on devices of all shapes, sizes, and price tags. Even Chinese budget phone manufacturer Doogee plans to incorporate one into its upcoming handset. The Mate RS’s implimentation wasn’t particularly responsive, especially compared to its super-fast rear fingerprint reader. I had to repeatedly press my thumb against the screen to get it to recognize. With this in mind, I couldn’t help but feel as though it was a bit of a white elephant. That said, if the tech matures to the point where it’s as speedy and accurate as a conventional fingerprint reader, I can see myself changing my mind. Another quirk of the Mate RS is the storage options on offer: the entry level phone costs €1695 and packs an astonishing 256GB of space to store apps, photos, and songs (which, by the way, is more storage than on the laptop I’m currently using to write this review). This is the version that Huawei seeded us with, and it goes without saying that in the short amount of time I had my hands on the Mate RS, I didn’t come close to making a dent into this. There’s another level after that. €2,095 gets you a truly bonkers 512GB of storage. As far as I know, there are no other phones on the market that offer this storage configuration. That’s probably for a good reason. I’m what you’d consider to be a phone power user, and I can’t think of any reason why you’d need this. Even if you hoard photos and songs, and download apps with reckless abandon, you’ll struggle to fill this. I should point out that that holding such a piece of kit made me extremely self-conscious. Although the Mate RS is pretty tasteful (there’s no obscene gold plating, or ridiculously eye-popping logos), I was aware that I was using a device that costs more than the monthly salaries of some people. Even though it wasn’t my own personal phone, the high price made me terrified that I’d break it. The idea of shattering the display on such an expensive phone filled me with dread. Although, then again, if you’ve got the cash for this, you can probably afford to buy a screen replacement. So, here’s the million dollar (well, €2,095) question: if money was no option, would I buy the Porsche Design Huawei Mate RS? At the core of this ultra-opulent phone is something truly special. From the design and the feel, to the boundry-pushing technical extras (even if they ultimately underwhelm, like the in-screen fingerprint reader), this is probably the best Android phone on the market right now. It’s bold and it’s adventurous, and it’s just so damn cool. Huawei, Leica, and Porsche Design all deserve praise for this effort. Perhaps a better question to ask is: do you get €2,095 worth of phone for your money? Not really. But that’s not really the point, is it? The Porsche Design Huawei Mate RS is fundamentally a bold fashion statement. It’s a status symbol. No doubt it’ll fly off the shelves in China and the Gulf countries, where punters regularly buy ultra-extravagant phones to show to others that they’ve done well for themselves (one of the strongest markets for Vertu, the since-deceased UK luxury phone manufacturer, was China, for example). With this in mind, I must admit I felt extremely strange carrying it in my back pocket of my Primark jeans. Deep down, I knew that this phone wasn’t for me. But I digress, if you’ve got money and you want to flaunt it, this is the phone you’ll buy. Huawei knows this. Every device comes with its own certificate of authenticity. If you’re the type of person who’d stump for a gold-plated iPhone, or something similarly obscene, this is the handset for you. But at the same time, Huawei and Porsche Design have managed to craft something that’s ultra-luxurious while avoiding being gaudy. That’s quite an accomplishment. For everyone else, there are much more appropriate offerings. If you’ve got a spare couple of grand burning a hole in your pocket, you can pre-order the Porsche Design Huawei Mate RS here. Units should start shipping early next month.